Microsoft Office mobile apps are productivity mobile apps currently developed by Microsoft for Windows 10, Windows 10 Mobile, iOS, Android, and also works on Chrome OS. The core apps are Word, Excel, PowerPoint, and OneNote. Other Office apps, including Sway, Skype for Business, and SharePoint Newsfeed are available for download from the mobile app store on supported devices and platforms. They are meant to be compatible with desktop versions of the office suite. The suite of apps is free of charge for consumers with devices smaller than 10.1 in (26 cm), but business customers need to purchase an Office 365 subscription to take full advantage of the suite on larger screens. Originally released as Pocket Office on Windows CE v1.0 Handheld PCs in 1996, they were ported to Windows Mobile and Symbian. Word, PowerPoint, and Excel were previously bundled under the Office Hub for Windows Phone free of charge, while OneNote for Windows Phone was a standalone application. Originally called Office Mobile which was shipped initially as "Pocket Office", was released by Microsoft with the Windows CE 1.0 operating system in 1996. This release was specifically for the Handheld PC hardware platform, as Windows Mobile Smartphone and Pocket PC hardware specifications had not yet been released. It consisted of Pocket Word and Pocket Excel; PowerPoint, Access, and Outlook were added later. With steady updates throughout subsequent releases of Windows Mobile, Office Mobile was rebranded as its current name after the release of the Windows Mobile 5.0 operating system. This release of Office Mobile also included PowerPoint Mobile for the first time. Accompanying the release of Microsoft OneNote 2007, a new optional addition to the Office Mobile line of programs was released as OneNote Mobile. With the release of Windows Mobile 6 Standard, Office Mobile became available for the Smartphone hardware platform, but unlike Office Mobile for the Professional and Classic versions of Windows Mobile, creation of new documents is not an added feature. A popular workaround is to create a new blank document in a desktop version of Office, synchronize it to the device, and then edit and save on the Windows Mobile device. In June 2007, Microsoft announced a new version of the office suite, Office Mobile 2007. It became available as "Office Mobile 6.1" on September 26, 2007 as a free upgrade download to current Windows Mobile 5.0 and 6 users. However, "Office Mobile 6.1 Upgrade" is not compatible with Windows Mobile 5.0 powered devices running builds earlier than 14847. It is a pre-installed feature in subsequent releases of Windows Mobile 6 devices. Office Mobile 6.1 is compatible with the Office Open XML specification like its desktop counterpart. On August 12, 2009, it was announced that Office Mobile would also be released for the Symbian platform as a joint agreement between Microsoft and Nokia. It was the first time Microsoft would develop Office mobile applications for another smartphone platform. The first application to appear on Nokia Eseries smartphones was Microsoft Office Communicator. In February 2012, Microsoft released OneNote, Lync 2010, Document Connection and PowerPoint Broadcast for Symbian. In April, Word Mobile, PowerPoint Mobile and Excel Mobile joined the Office Suite. On October 21, 2010, Microsoft debuted Office Mobile 2010 with the release of Windows Phone 7. In Windows Phone, users can access and edit documents directly off of their SkyDrive or Office 365 accounts in a dedicated Office hub. The Office Hub, which is preinstalled into the operating system, contains Word, PowerPoint and Excel. The operating system also includes OneNote, although not as a part of the Office Hub. Lync is not included, but can be downloaded as standalone app from the Windows Phone Store free of charge. In October 2012, Microsoft released a new version of Microsoft Office Mobile for Windows Phone 8 and Windows Phone 7.8. This was followed up by the release of Office Mobile for iPhone on June 14, 2013, and Office Mobile for Android phones on July 31, 2013. In March 2014, Microsoft released Office Lens, a scanner app that enhances photos. Photos are then attached to an Office document. Office Lens is an app in the Windows Phone store, as well as built into the camera functionality in the OneNote apps for iOS and Windows 8. On March 27, 2014, Microsoft launched Office for iPad, the first dedicated version of Office for tablet computers. In addition, Microsoft made the Android and iOS versions of Office Mobile free for 'home use' on phones, although the company still requires an Office 365 subscription for using Office Mobile for business use. 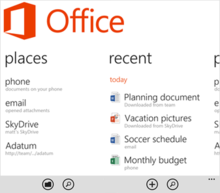 On November 6, 2014, Office was subsequently made free for personal use on the iPad in addition to phones. As part of this announcement, Microsoft also split up its single "Office suite" app on iPhones into separate, standalone apps for Word, Excel and PowerPoint, released a revamped version of Office Mobile for iPhone, added direct integration with Dropbox, and previewed future versions of Office for other platforms. 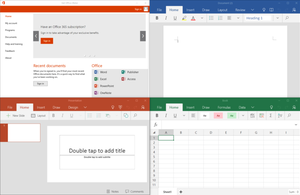 Office for Android tablets was released on January 29, 2015, following a successful two-month preview period. These apps allow users to edit and create documents for free on devices with screen sizes of 10.1 inches or less, though as with the iPad versions, an Office 365 subscription is required to unlock premium features and for commercial use of the apps. Tablets with screen sizes larger than 10.1 inches are also supported, but, as was originally the case with the iPad version, are restricted to viewing documents only unless a valid Office 365 subscription is used to enable editing and document creation. On January 21, 2015, during the "Windows 10: The Next Chapter" press event, Microsoft unveiled Office for Windows 10, Windows Runtime ports of the Android and iOS versions of the Office Mobile suite. Optimized for smartphones and tablets, they are universal apps that can run on both Windows and Windows for phones, and share similar underlying code. A simplified version of Outlook was also added to the suite. They will be bundled with Windows 10 mobile devices, and available from the Windows Store for the PC version of Windows 10. Although the preview versions were free for most editing, the release versions will require an Office 365 subscription on larger tablets (screen size larger than 10.1 inches) and desktops for editing, as with large Android tablets. Smaller tablets and phones will have most editing features for free. On June 24, 2015, Microsoft released Word, Excel and PowerPoint as standalone apps on Google Play for Android phones, following a one-month preview. These apps have also been bundled with Android devices from major OEMs, as a result of Microsoft tying distribution of them and Skype to patent-licensing agreements related to the Android platform. The Office mobile suite core applications include mobile versions of Microsoft Word, Microsoft Excel, and Microsoft PowerPoint. These apps are bundled together in the "Office Hub" on Windows Phone and Android phones, as well as on iPhones until November 2014. They support editing only the newer Office file formats (.docx, .xlsx, .pptx), and can only view but not edit the legacy file formats (.doc, .xls, .ppt). Office for Android tablets and Windows 10 can process legacy Office and ODF files (.ppt, .xls, .odp, .ods, .odt) online to edit and open them. Microsoft OneNote also comes with Windows Phone, but has been a standalone app, separate from the Office Hub, since Windows Phone 8. Office Mobile integrates with OneDrive, Microsoft's cloud storage service, as well as Dropbox. All documents edited from Office Mobile programs are automatically saved to OneDrive, and a list of recent documents saved to OneDrive appears on the home screen of the Office Hub. Office Mobile also includes a file manager that can be used to browse for Word, PowerPoint, or Excel files saved on a OneDrive account. In addition, Office Mobile can also open and edit documents saved on an Office 365 account. Word Mobile is a word processor that allows creating and editing documents. It supports basic formatting, such as bolding, changing font size, and changing colors (from red, yellow, or green). It can add comments, but can't edit documents with tracked changes. It can't open password protected documents, change the typeface, text alignment, or style (normal, heading 1); create bulleted lists; insert pictures; or undo. 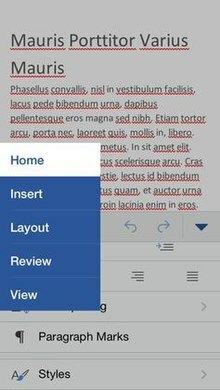 Word Mobile is neither able to display nor insert footnotes, endnotes, page headers, page footers, page breaks, certain indentation of lists, and certain fonts while working on a document, but retains them if the original document has them. In addition to the features of the 2013 version, the 2007 version on Windows Mobile also has the ability to save documents in the Rich Text Format and open legacy PSW (Pocket Word). Furthermore, it includes a spell checker, word count tool, and a "Find and Replace" command. In 2015, Word Mobile became available for Windows 10 and Windows 10 Mobile on Windows Store. Excel Mobile is a spreadsheet program that can edit XLSX files. It can edit and format text in cells, calculate formulas, search within the spreadsheet, sort rows and columns, freeze panes, filter the columns, add comments, and create charts. It can't add columns or rows except at the edge of the document, rearrange columns or rows, delete rows or columns, or add spreadsheet tabs. The 2007 version has the ability to use a full-screen mode to deal with limited screen resolution, as well as split panes to view different parts of a worksheet at one time. Protection settings, zoom settings, autofilter settings, certain chart formatting, hidden sheets, and other features are not supported on Excel Mobile, and will be modified upon opening and saving a workbook. In 2015, Excel Mobile became available for Windows 10 and Windows 10 Mobile on Windows Store. PowerPoint Mobile is included with Windows Mobile 5.0. It is a presentation program capable of reading and editing Microsoft PowerPoint presentations, although authoring abilities are limited to adding notes, editing text, and rearranging slides. It can't create new presentations. Versions of PowerPoint Mobile for Windows Phone 7 can also watch presentation broadcasts streamed from the Internet. In 2015, Microsoft released PowerPoint Mobile for Windows 10 as a universal app. In this version of PowerPoint users can create and edit new presentations, present, and share their PowerPoint documents. Microsoft OneNote Mobile was first released in Windows Mobile 6. Microsoft OneNote Mobile is included in the "Office Hub" in Windows Phone 7, but became a standalone application in Windows Phone 8. Still, it was listed in the Microsoft Office Mobile license as a core application. It features integration with Office Lens, an application that can capture whiteboards, blackboards, digital copies and documents on pieces of paper and allow users to edit them in Microsoft OneNote Mobile. Every note is automatically time-stamped and can be filled with words, pictures and recorded audio. It includes features like "to-do lists" but only has a limited option for formatting and layouts and includes no additional fonts. OneNote was eventually included with Windows 10 and was made available on Windows Store. Outlook Mobile is a personal information manager. Formerly called Acompli, it was released in April 2014. In December 2014, it was acquired by Microsoft and renamed Outlook Mobile. It runs on Android, iOS, Windows 10 Mobile and Windows 10. Outlook Mobile serves an email client, calendaring app, address book and file sharing app. It supports Gmail, Outlook.com, Yahoo! Mail and Exchange Server mail services, as well as OneDrive, iCloud, Dropbox and Google Drive file hosting services. Outlook Groups is a group collaboration app for Windows Phone, Windows 10 Mobile, Android and iOS. It is the client app of a service called "Office 365 Groups" that lets users create groups, mention their contacts, share Office documents via OneDrive and work on them together, and participate in an email conversation. The app also allows the finding and joining other Outlook Groups. Outlook Groups can be downloaded free of charge but requires an Office 365 subscription. Mobile users can also collaborate with desktop computer users who have Microsoft Outlook 2016, OneDrive for Business 2016, Skype for Business 2016, Power BI and Dynamics CRM. A mobile version of Lync can be downloaded in Google Play, iOS App Store, and Windows Phone Store. SharePoint Newsfeed can be downloaded in the iOS App Store, Windows Phone Store, and Windows Store (for Windows 8) but is unavailable for Android. On January 29, 2015, Acompli, a mobile personal information manager app and startup for iOS and Android which was acquired by Microsoft in December 2014, was re-branded as Outlook Mobile. A mobile version of Sway is available for iOS. Apps for Windows Phone and Android are in development. Reception of Office Mobile for iPhone and Android in 2013 and early 2014 was mixed. Dana Wollman of Engadget felt that Office Mobile for iPhone had a "minimal feature set", better than Google Drive in some ways but "miles behind other office apps for iOS". David Pogue, reviewing for The New York Times concluded that the "non-Microsoft competitors are already far more useful." Joe Hindy of Android Authority was more positive, writing that it was comparable with competitors and it was worth checking out. He liked that Office Mobile was free, theoretically had better compatibility with Microsoft Office documents, and had good design, but he disliked that there weren't advanced formatting tools and that Android tablets weren't supported. Reviews of Office for iPad were positive, praising the additional features and beauty compared to other office suites on the iPad. Reviews for Office for Android tablets were mixed. Derek Walter of Greenbot criticized the non-instant saving but liked the full-featuredness. Sarah Mitroff of CNET criticized the requirement of having a Microsoft account to make edits. For the Windows 10 version, Barry Collins said "we’re largely underwhelmed by the Office apps on Windows. At best, they’re as good as the equivalents for iOS and Android. In some cases, such as with PowerPoint and OneNote, there's a lot of work to be done." ^ a b c "Word Mobile". Windows Store. Microsoft. Retrieved June 26, 2016. ^ a b c "Excel Mobile". Windows Store. Microsoft. Retrieved June 26, 2016. ^ a b c "PowerPoint Mobile". Windows Store. Microsoft. Retrieved June 26, 2016. ^ a b c "OneNote". Windows Store. Microsoft. Retrieved June 26, 2016. ^ a b c d e "Office on mobile devices". office.com. Microsoft. Retrieved August 29, 2013. Core editing is free for consumers on devices with screen sizes smaller than 10.1". ^ a b Hoffman, Chris (June 22, 2016). "How Android apps transformed my Asus Chromebook Flip into an entirely new device". PC World. IDG. ^ a b Protalinski, Emil (March 27, 2014). "Office for iPhone and Android phones is now completely free, Android tablet version coming 'in the future'". The Next Web. ^ "Free Microsoft Office for iPhone and Android apps confirmed". BGR. BGR Media. March 28, 2014. Retrieved April 28, 2014. ^ Warren, Tom. "Microsoft's next surprise is free Office for iPad, iPhone, and Android". The Verge. Vox Media. ^ "Announcing the Office you love, now on the iPad". Office Blogs. Microsoft. Retrieved January 10, 2016. ^ "How to buy Office Mobile 2010". Microsoft Office website. Microsoft. Archived from the original on June 20, 2010. Retrieved April 28, 2014. ^ "Microsoft mobile solutions available on Nokia smartphones". Microsoft Office website. Microsoft. Archived from the original on February 10, 2011. Retrieved April 28, 2014. ^ Utter, David. Windows Mobile Now With PowerPoint! Archived December 8, 2007, at the Wayback Machine. WebProNews.com. Retrieved September 13, 2007. ^ Pratley, Chris. Out and About with OneNote Mobile. MSDN Blogs. Retrieved September 13, 2007. ^ Langridge, Jason. Windows Mobile 6 - What's New and What's Cool?. MSDN Blogs. Retrieved September 14, 2007. ^ a b Chan, John. Japanese WM6 and Office Mobile 2007 Archived June 10, 2007, at the Wayback Machine. Crave - CNET Asia. Retrieved September 13, 2007. ^ Montalbano, Elizabeth (August 12, 2009). "Microsoft, Nokia Team to Put Office Apps on Mobile Phones". PC World. Retrieved August 12, 2009. ^ "Get Microsoft Office for Symbian". Conversations. Nokia. April 10, 2012. Retrieved April 28, 2014. ^ Litchfield, Steve; Gilson, David (February 24, 2012). "Microsoft Apps released for Nokia Belle". All About Symbian. Retrieved April 28, 2014. ^ "Microsoft Office Suite Coming To Symbian Smartphones". 3g.co.uk. April 11, 2012. Retrieved April 28, 2014. ^ "Office Lens: A OneNote scanner for your pocket". Office Blogs. March 17, 2014. Retrieved March 6, 2015. ^ "Office for iPad and iPhone go free-to-use, now supports the iPhone too [Updated]". Ars Technica. ^ Koenigsbauer, Kirk (January 29, 2015). "The Office you love is now on your Android tablet". Office Blogs. Microsoft. Retrieved January 29, 2015. ^ "Bringing Office to everyone". Office Blogs. Microsoft. November 6, 2014. Retrieved December 18, 2014. ^ Keizer, Gregg (July 15, 2015). "Office for Windows 10 will require Office 365 subscription on PCs, larger tablet". Computerworld. Retrieved July 16, 2015. ^ "Office for Android phone is here!". Office Blogs. ^ Trent, Rod. "Microsoft Inside: 20 New Android Device Manufacturers Sign-on to Pre-Install Office and Skype". SuperSite for Windows. Penton. Retrieved August 23, 2016. ^ "Xiaomi will bundle Microsoft's Office and Skype apps on its Android devices". The Verge. Retrieved August 23, 2016. ^ "What's this Microsoft online service?". Retrieved March 6, 2015. ^ a b Surur, Suril (May 17, 2012). "Windows Phone 8 to sport a stand-alone OneNote app". Windows Mobile PowerUser. ^ Yegulalp, Serdar (November 5, 2014). "Microsoft's Dropbox deal is a not-so-hidden push for Office 365". InfoWorld. IDG. ^ a b c Ralph, Nate. "Office for Windows Phone 8: Your handy starter guide". TechHive. Retrieved August 30, 2014. ^ a b c Wollman, Dana. "Microsoft Office Mobile for iPhone hands-on". Engadget. Retrieved August 30, 2014. ^ a b Pogue, David. "Microsoft Adds Office for iPhone. Yawn". The New York Times. Retrieved August 30, 2014. ^ a b Unsupported Features in Word Mobile. Microsoft. Retrieved September 21, 2007. ^ a b Ogasawara, Todd. "What's New in Excel Mobile". Microsoft. Archived from the original on February 8, 2008. Retrieved September 13, 2007. ^ a b "Unsupported features in Excel Mobile". Microsoft. Archived from the original on October 20, 2007. Retrieved September 21, 2007. ^ Use Excel Mobile Archived October 20, 2007, at the Wayback Machine. Microsoft. Retrieved September 21, 2007. ^ Use PowerPoint Mobile. Microsoft. Retrieved September 14, 2007. ^ "Use Microsoft PowerPoint Mobile". Windows Phone How-to (United States). Microsoft. Retrieved April 28, 2014. ^ "Windows Mobile 6". PC Magazine. Ziff Davis. August 15, 2009. Retrieved February 9, 2014. ^ Viswav, Pradeep (April 9, 2014). "Office Lens App Now Available For Download From Windows Phone Store". Windows Mobile PowerUser. ^ Fraser, Adam (6 October 2014). "Office 365: OneNote on your Windows Phone". Lumia Conversation. Archived from the original on 9 February 2015. ^ Edmonds, Rich (September 23, 2015). "Microsoft releases Outlook Groups for Android to help you engage with your team". Android Central. ^ Callaham, John (September 19, 2015). "Outlook Groups app is now available for Windows 10 Mobile and Windows Phone 8.1". Windows Central. Mobile Nations. ^ "Introducing availability of Office 365 Groups in Outlook 2016". Office Blogs. Microsoft. September 22, 2015. ^ Callaham, John (March 7, 2013). "Microsoft launches SharePoint Newsfeed app for Windows Phone and iOS". Neowin. Neowin LLC. Retrieved April 28, 2014. ^ Callaham, John (July 15, 2013). "Microsoft quietly launches Windows 8 SharePoint NewsFeed app". Retrieved June 24, 2015. ^ "Microsoft rebrands Acompli as Outlook for iOS and Android". The Verge. Retrieved January 31, 2015. ^ Olivarez-Giles, Nathan (October 1, 2014). "Microsoft Sway Aims to Automate Beautiful, Responsive Web Design". The Wall Street Journal. Dow Jones & Company. Retrieved October 1, 2014. ^ Hindy, Joe. "Microsoft Office for Android review". Android Authority. Android Authority. Retrieved March 31, 2014. ^ Hachman, Mark (March 27, 2014). "Microsoft Office for iPad review: Finally! True productivity on your tablet". PCWorld. Retrieved March 7, 2015. ^ Parker, Jason (March 27, 2014). "Microsoft Office for iPad (iOS) review". CNET. Retrieved March 7, 2015. ^ Walter, Derek (January 29, 2015). "Hands-on with Office for Android tablets: polished and ready for mobile productivity". Greenbot. Retrieved March 7, 2015. ^ Mitroff, Sarah (February 4, 2015). "Microsoft Office for Tablet (Android) review". CNET. Retrieved March 7, 2015. ^ Collins, Barry (March 5, 2015). "Review: Microsoft Office Preview apps for Windows 10". PC Pro. Retrieved March 7, 2015.